I have just arrived to Ballycastle in Northern Ireland, to be with friends for a New Years retreat. We live right by the wild North Atlantic, and yesterday after arriving we took a walk down to the cliffs at Kilbane. After a while I made my way on my own seeking out a place where I could dance with this incredible place, on my own – to really arrive. To really land. It began a little self-consciously. What if I were spotted? 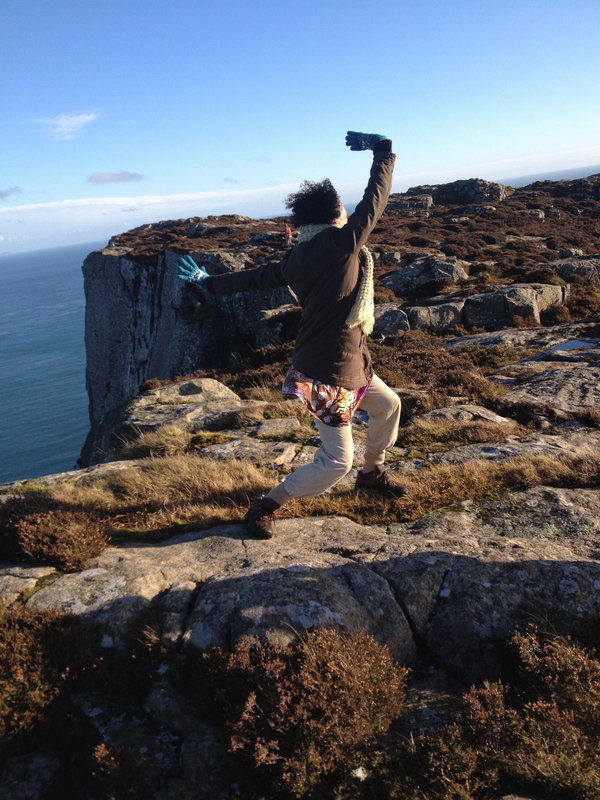 “Lone woman seen dancing wildly on the cliffs at Kilbane.” Now that doesn’t seems like such a terrible occurrence, but then it felt like something I would prefer to avoid. So the beginning of the dance was awkward. Self-limiting. Small movements. Peeks across my shoulders. Still I persisted. I danced with the elements, inviting them one by one into my dance, into my body, into my spirit. Slowly grounding through earth and then, thankfully, and perhaps inevitably releasing, letting go with a great Whooopie when Fire joined. Yes, fire got me going – and then I was free. Free. To dance. In this place of raw beauty. All the elements were here with me: The great rocks of Mother Earth, the Fire of the setting sun and the wildness in my heart that this land awakens in me, the Waves crashing against the rocks, crashing, the wild Wind blowing blowing blowing my heart into great delight. I am feeling a little giddy in this moment. I think it is from the awesomeness of swirling on the Northern coast of Ireland, with the elements dancing me too, with me dancing the elements. I felt, I feel like I am truly coming home to my wildness. Dancing the earth alive. Nonsense, she is alive already. Dancing the life she is giving me, you, everyone, And in that dancing giving it more strength, more Is’ness. The dance continues – it is now 115 days of dance. Each day another dance, another step into a new experience of being Alive. It has changed my life. I am a different person, woman, body. Weight has been shed, I think it is not only weight, but also emotional density that has loosened and flown away in the movement. My mind and emotions are lighter too. My whole being is full of Joy. Vibrating joy. Light. Space. Invited in as I join in the motion of all things. Yesterday I read a reading of a psychic friend of mine. It helped me see more clearly why the dancing journey has been so incredible. We enter our divinity through love. Love for self, and love for Other. Even as we see something that we do not approve of, can we love it? Can we truly love it? In the dance I love myself. It is that simple. It is not an intellectual ‘should’. It simply is a feeling of delight, of appreciation for Me, for Being here, in this Body, on this Earth, in This Moment. In this place gratitude flows, abounds – and the world as I have known it begins to change. Subtly, almost imperceptibly at first, yet profoundly, and here I am 115 days later in love with myself, in love with my life, connected to the land on which I make my home, connecting to my husband in a way that I haven’t before. The dance springs from love. Love for myself, love for this body, love for this earth – and knowing in my bones that I have found a practice that keeps me connected to these. I have found a practice that opens my body, my heart, my mind – and let’s the oxygen of love flow through me as barriers dissolve. Perhaps I should add that the dance is changing. Deepening. Becoming more sacred. Inspired by Movement Medicine, I am now dancing most days a dance in which I invite in and dance with the four elements of Earth, Fire, Water and Air. I can – literally – dance the world alive. My world. My body. My connection to the earth that holds me, the fire of the sun that burns in my cells, the waters that cleanse, and the wind, the breath of life – that allows me to soar. As I dance, I notice where there is flow and movement, where there is stuckness. I touch it and dance with it. After the dance I marvel at how much I have shifted, moved simply through the grace of the movement of the dance. Creating new space in me. Healing space. And here I am in a practice that offers me this naturally. Simply. Almost automatically. I dance on – filled with gratitude for this body that transports me through this life in its fullness and beauty.